Mission accomplished! The mid-February 2018 price chart series is now complete! 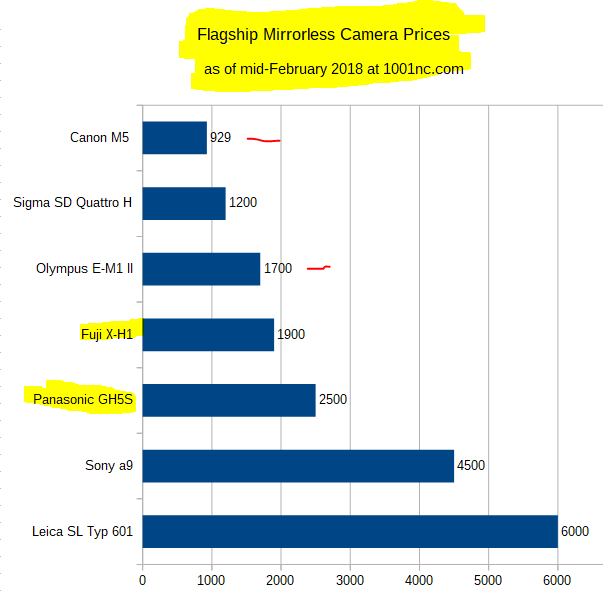 The Fixed Lens Cameras had some price activity, but we only had one new camera, but at the same time, we “lost” zero cameras since the November 2017 update. This is the biggest one of the groups, it’s Mirrorless time! Already this segment added six new cameras (five of which in 2018 and that was just from three manufacturers). And we are back now with Episode II in our mid-February 2018 series of the Camera Price Charts, we take a look at the APS-C DSLRs. We had no new APS-C DSLRs since our November update and we “lost” the Nikon D5300 as it is no longer available in new condition at the three reference retailers [details at the bottom of the post]. The story of this update is the madness of Canon’s pricing. Both the D-Rebel T6s and T6 prices have skyrocketed, while the illogical pricing of the D-Rebel T5i continues (the body only costs $100 more than the T5i with the kit lens). And we are back with another edition of the Price Charts series! We take a snapshot of the prices and compare them to each other and previous installments of the Camera Price Charts. As before, we start with 35mm full frame cameras. Not just interchangeable lens, but any camera that has a 35mm FF size sensor! 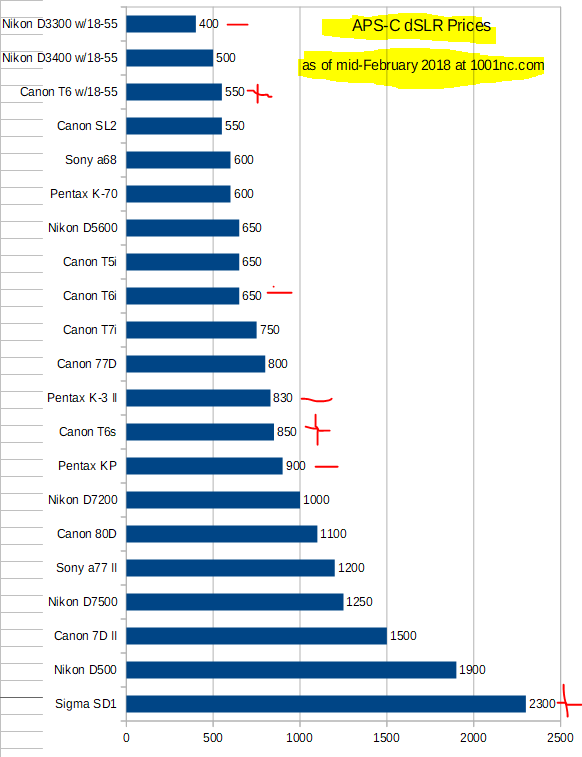 In order to make this chart readable, manageable and relevant, the various Leicas ranging from $4K to $8K are not included. 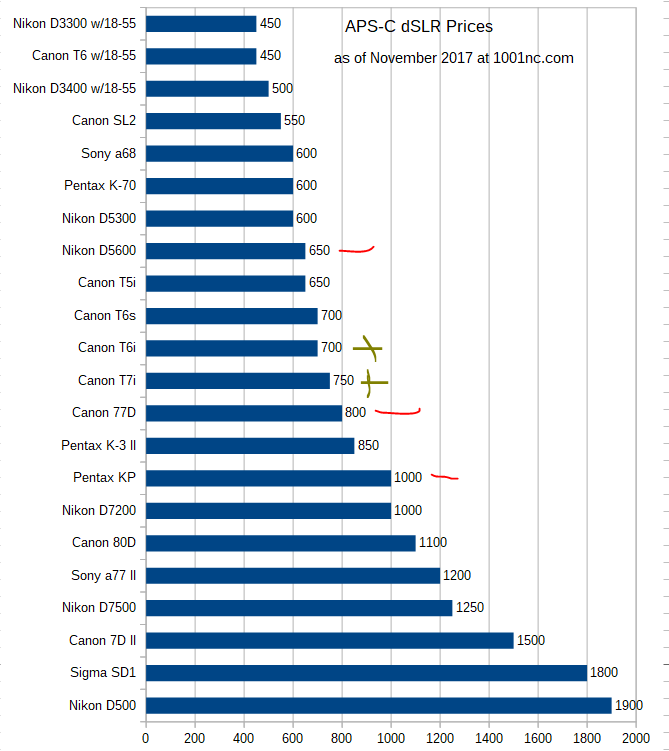 Camera Price Charts November 2017 Episode IV: RAWsumers Keep Going! 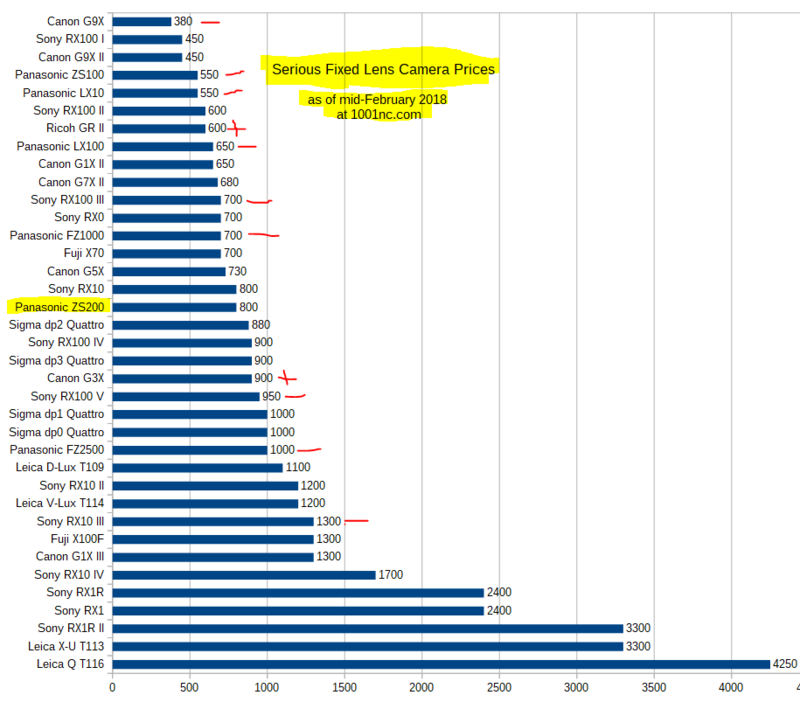 The popularity and advancement of smartphones, the parade of mirrorless options, and $1000-ish full frame DSLRs have not, as some of the doomsayers foretold, killed the serious fixed lens camera. Not only that, but we had three new models since our previous update in July 2017. One of the three was even a new segment for RAWsumers, the “serious elementproof action cam” in the Sony RX0. The storied Canon G-series has now “graduated” to an APS-C sensor with the brand new G1X III, and its price too adjust upwards to factor the larger sensor size. This is the biggest of the Price Charts, with the most cameras and most charts too! It’s mirrorless time! They are after all “winning” 2017 by a score of 12-8 vs DSLRs. A field goal can no longer tie the game 😉 This is episode #3 in the November 2017 series. We are back today with Day #2 of this incarnation of the Price Charts series, taking a look at APS-C DSLRs! To see the full chart, click on the picture, or use the direct PNG link. And now the last installment in the July 2017 series, we are zooming in on a DSLR vs Mirrorless tet-a-tet with 35mm full frame sensors! The focus is on made-for-digital mirrorless cameras, meaning no rangefinders in this particular comparison. Part IV of our July 2017 “Price Charts” series is here, focusing on Serious Fixed Lens cameras of all kinds. This year, I removed cameras with 1/2.x” sensors from consideration ~ sensors growing in size in all directions, even in smartphones. Part III of our July 2017 “Price Charts” series is here, focusing on Mirrorless cameras of all kinds. Rangefinders are not included, nor cameras with sensors larger than 35mm. This is the Revised Edition! Part II of our July 2017 “Price Charts” series is here, focusing on APS-C DSLRs. Other cameras with APS-C size sensors will be listed in their appropriate categories, either Mirrorless or Fixed Lens Cameras. Yesterday we covered the 35mm Full Frame Cameras (all kinds, not just DSLRs). They are grouped like this to keep the groups at a manageable size and logically meaningful.